In my two decades of regularly attending performances at Lyric Opera of Chicago, I’ve witnessed a real sea change of improvement in the recruitment and training of the members of the Ryan Opera Center ensemble. Years ago, audiences frequently grumbled about members of that ensemble in major supporting roles in Lyric performances. But those complaints have largely disappeared. Last Sunday’s “Rising Stars in Concert”, featuring the Ryan Opera Center ensemble and members of the Lyric Opera Orchestra, was not only a stirring and entertainingly musical afternoon, but also a showcase for several singers who are fully ready to assume major careers as opera singers. Conductor Christopher Allen showed remarkable verve and versatility, stylishly and propulsively leading arias and scenes moving from Mozart to Donizetti to Verdi and on to verismo. And all the young singers responded with energy and technical agility, their joy in singing very palpable. The four singers who are finishing the program provided many of the highlights of the afternoon. The plush-voiced spinto soprano Ann Toomey was absolutely splendid, both in her jewel-toned “Je souffre!…Charme des jours passés” from Massenet’s Herodiade, and even more potent as Giselda in Verdi’s glorious third act trio from I Lombardi. Her high notes soared with ease, her dramatic commitment was excellent, as she poured forth clear, expressive tone throughout. Also impressive was soprano Whitney Morrison, particularly in a searing, white-hot version of Cleopatra’s final monologue “Give me my robe, put on my crown” from Barber’s Antony and Cleopatra. This aria will be forever associated with Leontyne Price, but Ms. Morrison brought her own clear interpretation, sultry and smoky, and very physically expressive. Also finishing the program is tenor Josh Lovell, enormously impressive in Idreno’s aria “Ah, dove il cimento?” from Rossini’s Semiramide. Lovell tossed off the role’s treacherous runs with ease and clarity, and let forth some stunning laser-beam high notes. This is a tenor ready for prime time in roles currently occupied by Juan Diego Florez and Lawrence Brownlee. The fourth member finishing was bass-baritone Alan Higgs, a charming Leporello in the Don Giovanni sextet, and a stirring Aleko in the aria “Ves’ tabor spit” from Rachmaninov. Higgs has a smooth, attractive voice but it’s a bit too small to have much dramatic effect in the huge house. Now I’d like to talk about contralto Lauren Decker. 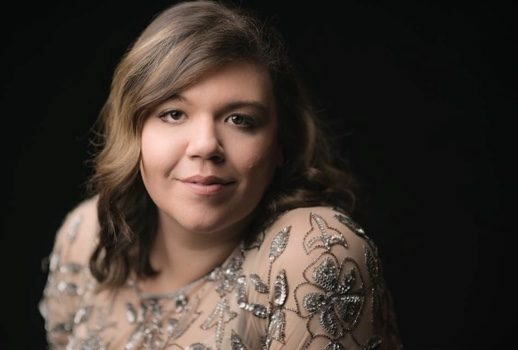 In recent seasons, I’ve heard her make small roles stand out—the best Annina in Traviata and Inez in Trovatore in my experience, pouring out dark, chocolatey sound with a plushness of tone and amplitude of voice rarely heard in a young singer. And here, in the concert, she was again stunning as Princess de Bouillon in the Act Two duet “Non risponde” from Adriana Lecouvreur (with Whitney Morrison as Adriana), dramatically stirring with remarkable high and low notes. Later, she took on the Princess again in her aria “Acerba volutta!…O vagabond stella.” In the aria, she had a bit of trouble negotiating between the middle and lower registers, but it was nevertheless a thrilling dramatic sound. Another highlight was the singing of tenor Eric Ferring, so impressive recently in the Lyric production of Handel’s Ariodante. Ferring brought pure, plaintive beauty of tone both to his Don Ottavio in the Don Giovanni sextet and most particularly in his utterly charming Nemorino in the duet “La donna e un animale stravagante davvero!…Venti scudi” from Donizetti’s L’elisir d’amore, aided by the blustering Belcore of Christopher Kenney. If there was a misstep, it was the opening duet from Mozart’s Mitradate, re di Ponto, with mezzo Kayleigh Decker and soprano Emily Pogorelc sounding a bit forced and shrill. Ms. Decker later returned for excellent turns as Donna Elvira and Isolier in a delightful Le comte Ory duet with Josh Lovell. Other fine contributions came from David Weigel, Ricardo Jose Rivera, and Mario Rojas. I look forward to their future appearances on the Lyric Opera mainstage. Radio listeners in the Chicago area can hear this concert in its entirety beginning at 7 p. m. Central time Sunday, April 14 on 98.7WFMT and wmft.com. I definitely recommend that you give it a listen.